Today’s working environments are characterized by and at the same time highly depending on many repetitive hand movements, such as typing or assembling tasks. The physical health of hands is thereby becoming increasingly valuable. Guided by the idea of Tangible User Interfaces (TUIs), we introduce a novel graspable device, called HANDle,that we developed to train wrist agility,finger strength as well as its coordination in a motivational game.Therefore,we iteratively prototyped a fully-functional controller that senses multiple finger forces, its relative position in space and that provides visual and vibro-tactile feedback. In addition, we implemented a therapy game that combines different physiotherapeutic motion and grasp exercises supporting custom-defined levels that match to the patient needs. 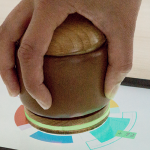 HANDle: A Novel Tangible Device for Hand Therapy Exergames.